If your home is like any other in the western world, the space that is your kitchen and dining area is without a doubt your homestead’s epicenter of all the things familial and social. When you think about your home’s daily ongoings, you can see that this kitchen and dining space should fit like a glove and cater to all your family’s particular needs, lifestyle, and aesthetic. Updating and remodeling your home is the perfect time to address and accommodate your family’s needs. When crafting these details, it certainly helps to have a wide selection of furniture, hardware, and decorative materials at your disposal. While achieving the perfect kitchen that is truly custom to your home, you need room to be creative without compromising on craftsmanship and quality. A lot of that can depend on a kitchen designer’s materials supplier. Versatility, quality, craftsmanship, and value in your home’s design materials can provide unlimited possibilities, getting you just what you want without breaking the budget. 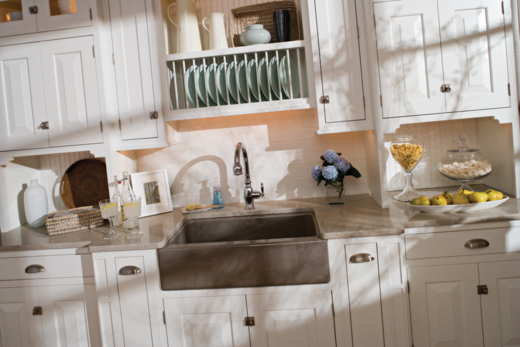 That’s why Kitchen Kraft Remodeling is proud to have Dura Supreme as a custom cabinet supplier. Dura Supreme has over 50 years of creating beautifully handcrafted cabinetry with exceptional construction quality. Working with home interior designers and remodelers such as Kitchen Kraft, Dura Supreme brings each unique design choice to life, crafting custom-tailored cabinets for every homeowner while providing creative possibilities that won’t break their budget. Founded in the 1950’s by Donald Stotts, Dura Supreme has garnered such a recognition of quality that has led to the expansion of ten facilities over the years, now passed on to the original founder’s son, Keith Stotts. Their dedication to quality and innovation has found a remarkable balance of precision, quality, and value, using state-of-the-art equipment and technology while maintaining true cabinet maker’s craftsmanship.